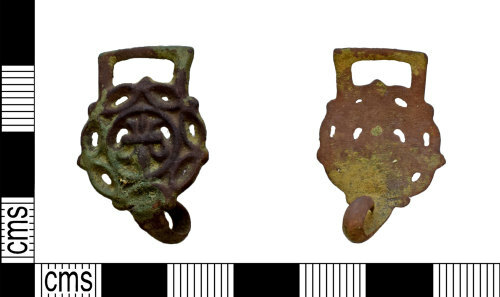 A complete copper alloy hooked tag or dress fastener of Post Medieval date (AD 1500-1600). The object consists of a flat piece of copper alloy with a back facing curved rectangular hook placed vertically at the lower edge. An inverted-trapezoidal lobe is placed at the upper edge of the dress fastener. Below this the body of the fastener is broadly circular in plan. The decoration consists of a central flur-de-lis inside a circle with ovate openwork within the outer boarder. The central motif is surrounded by six evenly spaced perforations forming an openwork pattern each of which is in turn bordered by a raised ovate boarder. The metal is a dark brown in colour with areas of light green corrosion. Bailey (2004) illustrates a dress hook with a similar fleur pattern on page 98, Nos 363-364, which are dated from the 16th century. Bailey also illustrates how the fastener would have been used as part of a hasp and clasp fastener, as illustrated in Fig 2.44. The pierced lobes from this example were used to sew the set to a garment, possibly a cloak. There are similar examples on the database (BH-59537A) discovered in Oxfordshire and (SWYOR-FEA025) discovered in Yorkshire. Length: 29.02mm, Width: 19.44mm, Thickness: 1.81mm, Weight: 3.1g. Bailey, G., (2004) Buttons and Fasteners 500BC - AD1840. Essex, Greenlight Publishing.